I'm no stranger to fake tanning. In fact, I actually have a bit of a complicated relationship with it. Middle school was rough, and long story short, I was teased mercilessly for how pale I was—bearing in mind this was the golden age of baking in the sun and/or lying in tanning beds the second school was out. Suffice to say, I've probably spent a year's salary on an impressive mix of spray-tan packages, lotions, mousses, aerosols, oils, mitts, removers, and pretty much every other kind of treatment or paraphernalia associated with the art of self-tanning. I've honed my practice, and while I've actually been working to lessen my faux tanning (it's a comfort blanket—what can I say? ), nothing makes me happier than a freshly applied layer of mousse or a professionally wielded airbrush session. I've tried every self-tanning brand in the business, and I've experimented with virtually every SKU and formula from each. (Remember: Having the perfect fake tan has been a deep-seated passion of mine since middle school, right around the time OG brands like Jergens and L'Oréal began launching self-tanning tints and lotions.) Being a beauty editor, I've also had the pleasure of meeting a healthy handful of the best spray-tan artists in the world—both the ambassadors and creators of top-selling brands. However, in trying harder to embrace my natural skin tone, it had actually been a hot second since I had applied self-tanner, let alone been sprayed by an industry-leading, celebrity-loved artist. So when I was offered the opportunity to meet with celebrity spray-tan artist and product developer Kristyn Pradas, I was intrigued. I had been craving an amazing tan, and after learning Pradas has been the exclusive artist behind Victoria's Secret Angels' runway glow for the past six years and works regularly with the radiant likes of Ariana Grande, Ashley Graham, the Hadid sisters, and Kate Beckinsale, I was sold. Plus, Pradas just launched her very own 100% natural self-tanning line just over a month ago, and being the aggressive tanning consumer I am, I felt obligated to check it out. I feel confident telling you that Pradas gave me the best (aka most natural, long-lasting, least-smelly) spray tan of my life; her product line, Pradas Glow, is impressive AF; and she's an angel of a human being to boot. It's fitting considering her angelic roster of clientele. Of course, as I was pretty much in the presence of self-tan royalty, I picked her brain for everything there is to know about self-tanning—from the best formulas to the biggest mistakes. Ahead, 12 self-tanning secrets from the woman who has seen Hollywood naked. Keep scrolling! "Full-body contouring is really popular in the tanning industry right now," Pradas explains. "This doesn't mean every muscle looks chiseled. It's just about accentuating someone's favorite features and camouflaging their less favorite. Everyone is different, of course, so this is a customized service per client." Of course, the second I got home from my appointment with Pradas (and during the days following), my thoughts were consumed with how the heck I could A) hire Pradas to become my personal full-time spray-tan artist (a girl can dream) and B) how I could attempt to get similar results at home, you know, when I wasn't getting sprayed in West Hollywood hotel suites. So naturally, I asked her to divulge her best at-home tanning tips, and interestingly, a lot has to do with how you keep your product arsenal stocked. "Have a package of makeup wipes and a few makeup sponges handy while you tan. Use the makeup wipes to make sure the palms of the hands are clean, and wipe off nails and toenails, after you apply the self-tanner. Then, go in and use the makeup sponge to blend your fingers—in between them—and around any areas that are naturally prone to creasing." Keeping in mind the popularity of body contouring, you can actually create a similar result at home by not covering every inch of yourself with the same dose of self-tanner. Of course, you'll naturally go lighter on areas like your hands, feet, and face, but Pradas's game-changing strategy goes beyond that. Her tip? Add a higher ratio of self-tanner to the areas you're looking to camouflage. Of course, we're all about proudly sporting every curve and inch of cellulite, but we're only human, and it's natural to want to play up what we love and draw less attention to the places we, well, maybe don't. "One of my best tips is to apply extra self-tanner to the areas you are looking to camouflage or conceal. For instance, darkening the outer thighs will make the area appear slimmer or more toned," reveals Pradas. "Additionally, darkening the inner thighs creates a slimming illusion when you're walking, in addition to darkening the sides of your waist. I suggest applying an entire layer of sunless tanner on the body and then going back and adding more to any areas you would like to camouflage." As someone who has experimented since high school in the art of at-home self-tanning, I almost never use anything other than a mousse these days. Thus, I was relieved when Pradas validated my love for a high-quality tanning mousse above all other self-tan formulas. That being said, some formulas are definitely better than others, as some dry so quickly that they're difficult to spread and distribute evenly—not good when you're looking for a natural, perfectly blended result. "The most effective self-tanning formula is a mousse to use at home," Pradas says. "But to ensure flawless results, I developed my own. 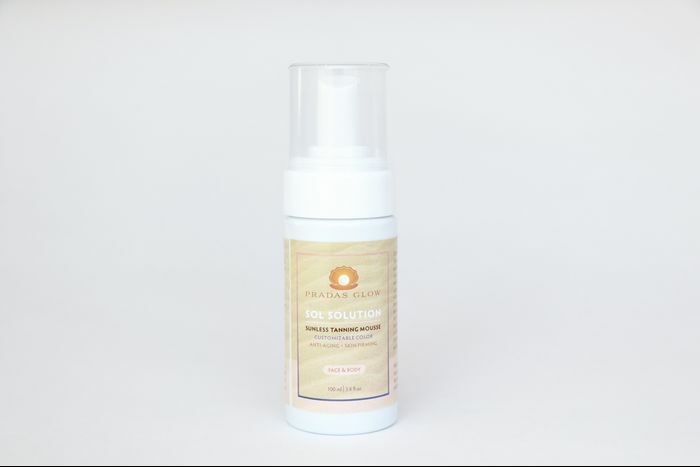 My Glow Sol Solution Sunless Tanning Mousse ($20) glides on easily and blends flawlessly, leaving you with a beautiful finish—even if you're a pro or a newbie!" Pradas's formula is honestly one of the best I've tried, and (amazingly) you can get dressed immediately without feeling wet or sticky like pretty much every other self-tanner I've dabbled in. Plus, the hyaluronic acid in her solution keeps your skin from drying out, which is essential for a long-lasting, even glow. Right now, anything labeled natural, clean, nontoxic, and/or organic is taking over the skincare stratosphere. Believe it or not, this includes the self-tanning industry, as more and more brands are jumping on the bandwagon of creating healthier, good-for-your-skin-and-body formulas. But it's good to know what your self-tanner can be (100% natural) and what it can't be (100% organic). Here, Pradas explains. "There can be 100% natural products for tanning. However, it cannot be 100% organic," Pradas confirms. "DHA, which tans the skin, is derived from sugar, so that is 100% natural. However, the compound of the sugar is changed to activate your skin cells to tan. This is 100% natural but not organic." "The problem with certain products on the market is that they contain a large number of extra additives that can be dangerous to breathe in and for your skin to absorb—especially if you use self-tanning products often," she says. Ultimately, the cleaner and more natural the ingredient list, the healthier you (and your skin) will be. Because as Pradas explains, to an extent, your skin will absorb whatever is applied. "Waxing should be done 24 to 48 hours prior to tanning and shaving at least 12 hours prior," Pradas tells us. "Additionally, your skin should be completely clean and clear of any and all makeup, lotions, perfumes, and deodorant." If you've used a mitt to apply your self-tanning formulas, you'll know that they make the biggest difference in terms of application, less mess, and overall flawlessness. And if you haven't used a mitt, consider yourself awakened. Because yes, it's a crucial step when creating your best fake tan ever. "Apply your self-tanning solution (preferably a mousse) to your mitt and not directly onto the skin from the bottle," says Pradas. "Then, begin working in circular motions beginning at your feet and eventually working your way up the body. Your neck and face should always be last." This way, Pradas explains, you'll avoid getting crease lines on your neck, and doing legs first also avoids creasing your stomach as you bend over repeatedly during your application. Regardless of whether you've gotten professionally sprayed or executed your tan at home, your first shower after the application should be a thorough one. Ensure the water is warm (not too cool and not too hot), and rinse every inch of your skin. Oh, and a high-quality shower filter isn't a bad idea, either—especially if you live in a big city with sketchy water quality, which will threaten the integrity of your tan. "One of the most common mistakes is not rinsing the bronzer off completely once it has developed," Pradas warns. "If you're not thorough, when you get out of the shower, you may have streaks of bronzer. People often think they have a streaky tan, but in reality, they just haven't rinsed off properly." All right, so this tip is short and sweet: Whenever you're getting out of the shower while sporting a sunless tan, never—we repeat: never—wipe or aggressively dry yourself off. Instead, grab your towel and gently pat yourself dry. When your skin is wet, the layer of tanner-tinted skin is far more prone to sloughing off, so you'll want to tread carefully to decrease your chance of premature fade or flaking. One of the things I was completely blown away by both while and after Pradas sprayed me was how good I smelled. I've only ever smelled disgusting after I've been sprayed professionally or self-tanned at home, even when I've been told I won't or a product promises a tantalizingly not-yucky scent—lies. Pradas's formula smelled truly delectable, and I didn't have the urge to gag the second I woke up the next morning. It was remarkable. "Some formulas smell terrible and make your natural body odor smell even worse, but this doesn't have to be the case," says Pradas. "My solutions have a beautifully pleasant, light, natural fragrance so you never have to worry about the way you smell! Plus, all of my products are formulated with sensitive skin in mind, so you don't have to worry about the light fragrance causing any type of irritation." "Aside from using a mitt, makeup wipes, and sponges as I mentioned above, in order to make sure a sunless tan lasts and looks natural, your skin must be hydrated," says Pradas. "This Skin Armour ($25) is my favorite tan extender. You'll apply it directly to dry skin right before you get into the shower. (Just not before your very first shower after you've been sprayed or applied your self-tan.) The Armour's blend of all organic oils protects your skin against the heavy metals and chlorine in the shower water that lightens and strips the tan." For extra moisture (especially during the dry doldrums of winter), Pradas recommends supplementing your hydration efforts with a product like her Glow Skin Glaze ($25) which features a luxe blend of organic oils that absorb quickly and leave your skin with a gorgeous glow and zero greasiness. And if you're acne-prone, like both myself and Pradas, fear not. The glaze actually helps control your skin's natural oil secretion to balance oil levels in the skin. Exfoliation is a pillar practice of spray tans and self-tanner alike, but timing is crucial. To extend your tan's life as long as possible, you'll want to focus on hydration, hydration, and hydration until you start to flake or fade. According to Pradas, it's only then that you'll want to reach for your exfoliator. Of course, she also recommends exfoliating two to three days before you apply your self-tanner in order to create an even and healthy base for your spray or product application. "When your tan is fading, you'll want to start exfoliating," Pradas confirms. "My favorite product is the above by Antheia Beauty. It's an amazing fake-tan remover that will remove any self-tanner from the skin flawlessly." Next up, fashion and beauty editors agree: You should always travel with these 18 products.